Left and right turns are where you, the motorcyclist is on the major road, intending to turn left or right onto a minor road. If you on the minor road approaching the major road, this would be a T-junction. For further information on T-junction procedure, see approaching junctions. 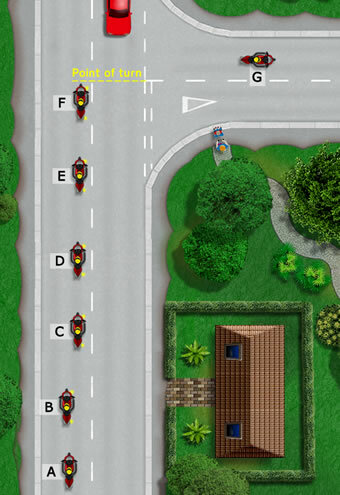 During your motorcycle riding test, you will cover many junctions, including left and right turns. There’s good reason for this; you’ll be doing this an awful lot once you have passed the test and statistically, junctions / left / right turns represent the most hazardous road areas for motorcyclists, being the leading location for accidents. A rider must not only learn a tried and tested method for dealing with left and right turns as detailed below, but it’s also essential that each and every turn is dealt with on an individual basis as all turns vary considerably. 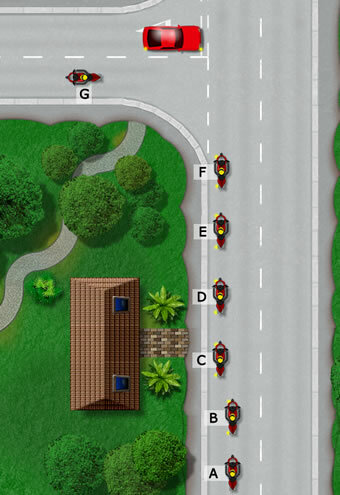 This tutorial covers the correct learning and test procedure for making left and right turns, along with potential hazards that a rider should anticipate when making the turns. Consider whether the junction is ‘open’ or ‘closed’ as soon as possible. An ‘open’ junction is where you can visibly see what is going on at the turn and into the road you intend on taking before making the turn. A ‘closed’ junction is the opposite in that the junction and the road you intend on taking is obscured. This can be due to parked vehicles, trees, hedges, fences, or anything else that can obscure your view. This is an important consideration because a closed junction may have hazards that are unexpected and so may require a slower approach speed. Hazards could be unseen parked vehicles on your exit road, pedestrians crossing on the new road etc. This tutorial advises the approach to a left turn, major to minor road, using the OSM PSL routine, along with potential hazards. D – Speed (S) – Ease off the throttle and if applicable, select the appropriate gear and begin slowing down. E – Assess the junction to determine if it is ‘open’ or ‘closed’ (see above for details). Based on what you see, or lack of, use an appropriate speed. This tutorial advises the approach to a right turn, major to minor road, using the OSM PSL routine, along with potential hazards. E – Look (L) – Look ahead for approaching traffic and judge their speed. If it looks like they’re moving quickly, stop and wait before crossing the road at the point of turn (see below). Look into the road you intend on taking for hazards. Be aware of people crossing the road at the junction and parked cars in the new road.